SOLAR ChumAlong Charger Features A Built-In Tracking System | OhGizmo! By Andrew Liszewski on 02/10/09 • Leave a comment! 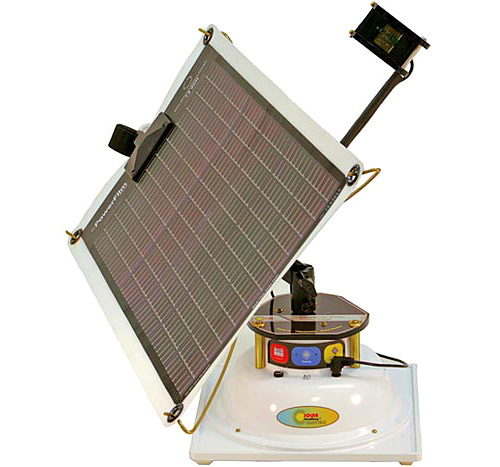 For a solar charger to operate at peak efficiency, it always needs to be oriented towards the sun. So instead of just sitting there, pointed in the wrong direction while the sun slowly progresses across the sky, the SOLAR ChumAlong (chum?) continually re-orients itself so it’s always pointing at the brightest point in the sky. This is accomplished with four optical sensors, and results in a 30%-50% increase in efficiency over conventional, stationary solar chargers. And while the SOLAR ChumAlong looks kind of flimsy, it’s actually designed to fold-up for easy transport, and can be setup in just a few minutes without any tools, making it a perfect addition to your camping kit. You can get it from Edmund Scientific’s for $399.00, but keep in mind that price doesn’t include the 12V rechargeable battery that’s required for operation.